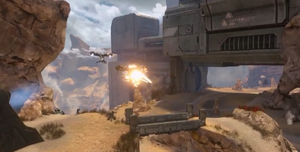 Diamondback was a Halo Online multiplayer map and a remake of the Halo 3 map Avalanche. Diamondback's layout is almost identical to Avalanche's. It takes place in a U-shaped canyon which is cut in half by a Lethbridge Industrial building. The bases consist of three levels. The first level is simply the ground-height entrance. These entrances lead up a ramp and onto the second floor, where the flag and Teleporter are situated. From the second floor, another ramp leads to the third level, which is essentially a walkway going across the front of the base. A Man Cannon is situated here, which launches the player about half way to the bottom of the 'U'. The landing zone of this man cannon is nearby another man cannon which launches players in the opposite direction, into the base. Rather than being snowy, like the map's two predecessors, it is set in an arid desert - the exact opposite. Minor terrain changes have been made, such as the placement of hills and rocks. The man cannons are much smaller than in Avalanche, and are human in design rather than Forerunner. The buildings and bases are also human design. The map is now on a moon instead of Installation 08. Loading screen of this map.